CREA Mont-Blanc is unique in that it is located so close to many of its monitoring sites. 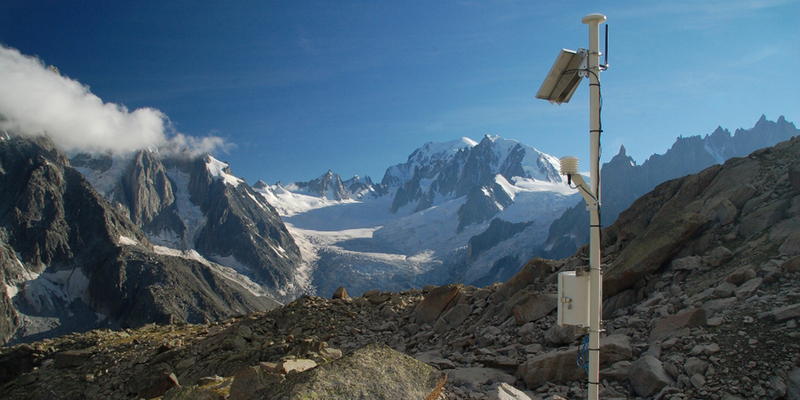 Our team carries out field work in a variety of different locations in the Mont Blanc massif, and also surveys data from over sixty weather stations that they have installed across the Alps. Below, we have highlighted our two main long-term monitoring sites: Loriaz and Couvercle/Jardin de Talèfre. CREA Mont-Blanc is currently working to establish several new monitoring sites in the massif, most notably as part of the ORCHAMP program. 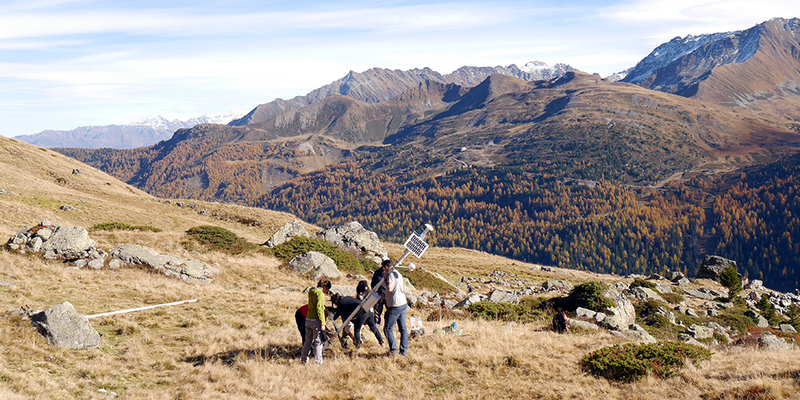 Piloted by the Zone Atelier Alpes/French National Center for Scientific Research (ZAA/CNRS), ORCHAMP is a project bringing together many different partners to put in place a system for monitoring environmental evolution in the Alps. Located in the Aiguilles Rouges, facing the Mont Blanc massif, Loriaz refers to a zone traversing elevation gradients that CREA Mont-Blanc has been monitoring for over a decade. In 2006, the first weather monitoring stations were installed at the base of the conifer forest, at tree line, and in the Loriaz alpine pasture at 2000 meters. In 2009, additional monitoring protocols were put in place, including nest boxes, frog monitoring sites, NDVI sensors, camera traps and time-lapse vegetation cameras. Loriaz is CREA Mont-Blanc’s most equipped site, and while some of the equipment is automated, many protocols require visiting the site to collect observations—an activity that members of our team often do alongside volunteers. Although the Couvercle and Jardin de Talèfre are not our most frequently visited monitoring sites, they are certainly the most majestic. Situated at 2,700 meters of elevation, the area is tucked in the heart of the range between the Aiguille Verte, the Grandes Jorasses and Mont Blanc. It was at the Couvercle Hut in the late 1980’s that CREA Mont-Blanc founder, Anne Delestrade first met current president, Nigel Gilles Yoccoz, while carrying out fieldwork for her PhD. CREA Mont-Blanc installed a weather station near the hut and Anne and Gilles both continue to visit the Couvercle to monitor their respective tagged animal populations (the Alpine chough and the snow vole). Not far from Couvercle Hut, the Jardin de Talèfre is an island of vegetation surrounded by glaciers and is the perfect place to examine the evolution of relatively undisturbed alpine area. 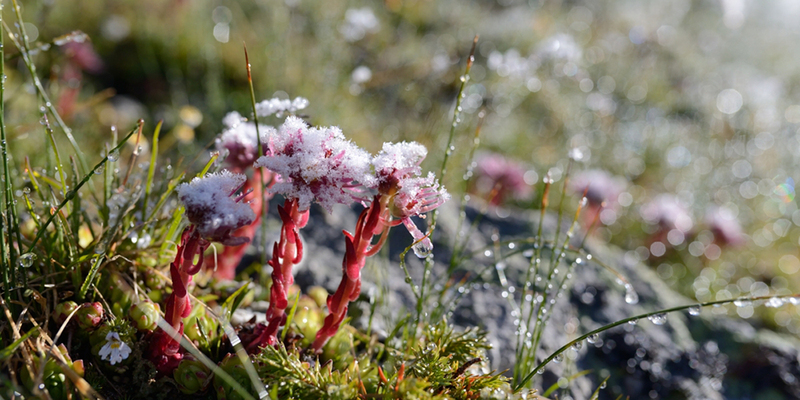 Populated by fascinating plant species with typical adaptations to their environment, members of the CREA Mont-Blanc team work with botanists to carry out scientific surveys.